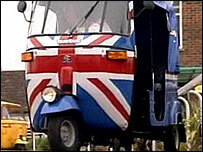 A public inquiry is to be held into a tuk-tuk taxi firm following an investigation into its operation. TucTuc Ltd launched its 12 vehicles in Brighton in July, but the Traffic Commission received complaints about how the service was run. The commission then asked the Vehicle and Operator Services Agency (VOSA) to submit a report on whether the service was being run as it was agreed. The inquiry following the report will be held in Eastbourne on 3 October. TucTuc Ltd applied to the south east Traffic Commission for a licence to run its taxi service. Alex Roberts, spokesman for VOSA, said the commission asked it to monitor the firm's taxi service after complaints were received about how it was run. The contents of the report and information about who made the complaints will not be disclosed until the inquiry is under way. Mr Roberts added that depending on the outcome of the inquiry, the traffic commissioner for the south east, Christopher Heaps, could decide to remove or limit the service run by TucTuc Ltd. He could also fine the firm up to £550 per vehicle, or stop it from registering further services, or decide that no action should be taken.